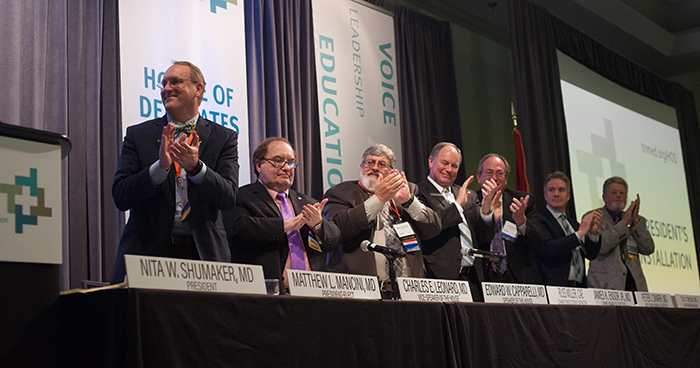 More than 150 physicians from across the state attended the Tennessee Medical Association House of Delegates' annual business meeting in Nashville this past weekend. Doctors representing a wide range of medical specialties, practice environments and geographic areas of the state debated and set policies of the Association, transitioned leadership positions and honored individuals and organizations with awards. "This is organized medicine in action," said Dr. Peter Swarr, newly elected Chair of the TMA Board of Trustees. "Healthcare is changing so much and so fast. Physicians must come together to lead at the state and national levels. We have to have constructive and productive dialogue - even when our opinions may differ - on challenges and opportunities like changing payment models, scope of practice, public health crises and other issues, for the good of the profession and our patients." Encouraging physicians to seek out mental health services to help reduce stress and improve their work life balance, and eliminate the stigma for physicians who disclose mental health conditions. Change state laws to give Tennessee medical school graduates who do not match in residency programs opportunities to practice under supervising physicians in areas of the state with a primary care physician shortage. Seek partnerships for a digital media campaign to educate adolescents about the dangers of opioids, and promote alternative pain management therapies. Petition health insurance companies to cover more alternative, non-opioid pain management therapies. Seeking federal action to allow methadone treatment programs to report controlled substance dispensing data at the state level. Dr. David Reagan, Chief Medical Officer of the Tennessee Department of Health, gave a presentation on Tennessee's opioid epidemic, including a summary of Governor Haslam's new law limiting initial opioid prescriptions. TMA worked with the General Assembly to substantially improve the law and is planning its own education efforts before the new law takes effect July 1. Dr. Matthew L. Mancini, a Knoxville surgeon, began his term as 2108-2019 President. He succeeds Dr. Nita Shumaker, a pediatrician in Chattanooga and just the second female ever to serve as TMA President. Several other TMA member physicians officially began their terms for 2018-2019 leadership positions. Dr. Peter Swarr, a pediatrician and internist in Brentwood, will serve as Chairman of the TMA Board of Trustees. Dr. W. Kirk Stone, a family medicine specialist in Union City, will serve as Vice Chair of the TMA Board of Trustees. Dr. John McCarley, a nephrologist in Chattanooga, was appointed as Secretary/Treasurer. Dr. Elise Denneny, a Knoxville otolaryngologist, will serve as TMA President-Elect. Dr. Edward Capparelli, a family physician in Jacksboro, was reelected as Speaker of the TMA House of Delegates. Dr. Charles Leonard, a family physician in Talbott, was reelected as Vice Speaker of the TMA House of Delegates. Outstanding Physician: Dr. Edward Capparelli of Jacksboro and Dr. Ronald Overfield of Nashville. Distinguished Service: Dr. Mukta Panda of Chattanooga and Dr. William Schaffner of Nashville. Community Service: Bridges for the Deaf and Hard of Hearing in Nashville, East Tennessee Health Information Network, and Sen. Bo Watson of Chattanooga.